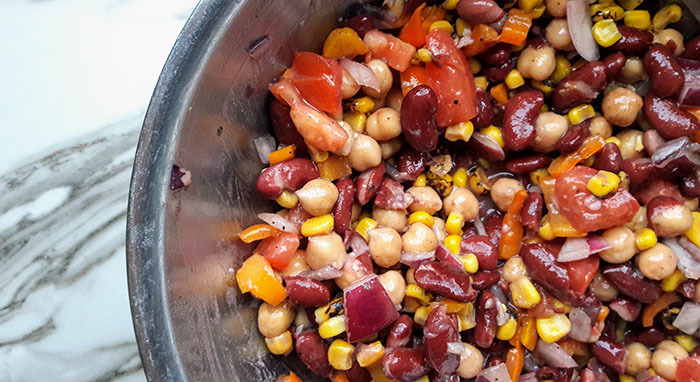 Propelled by the need to be better about bringing my lunch to work, I decided to make a bean salad that would hopefully last me a couple of days. Usually, we try to rely on leftovers, but I’ve found that there’s just not enough for the 2 of us to make that work throughout the week. Also, I was making Trader Joe’s tempura cauliflower last night and since my husband is trying to avoid sodium I thought I’d make this as an option for him. The thing about this recipe is that it’s not set in stone. I knew I wanted to make a bean salad so I looked at various recipes online, then improvised with what we had on hand. I wanted to make a pasta/bean salad, but we’re currently out of pasta so I’ll add that later today after we make our grocery run, but it doesn’t need it. I can also add this to a bed of greens just to add even more nutrition to my day. If you make this, please don’t stress about the ingredients. Use whatever peppers you have on hand, or leave them out and add something else. If you have cherry tomatoes, use those. I actually meant to use black beans instead of garbanzo beans, but somehow I grabbed the wrong can and didn’t realize it until I’d opened it. Oh well! It still turned out yummy! One thing that I’ve found with being vegan is that as long as you have some fresh veg and some canned or frozen food you can pretty easily mix up something amazing to eat. 1. Toast the frozen corn in a dry skillet for about 10 minutes, stirring often. 2. Mix the apple cider vinegar, crushed garlic, cayenne pepper, paprika, and cumin in a small bowl and let sit while preparing the other ingredients. 4. Combine the dressing with the main ingredients. Mix well.